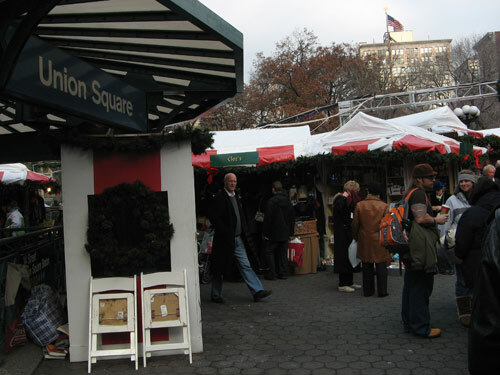 The ever-versatile and accomplished Ben Katchor is the 1995 recipient of a Guggenheim Fellowship, a 2000 MacArthur Fellow, an Obie Award winner (for his “comic-book opera,” The Carbon Copy Building), and creator of books, graphic novels, cartoon strips, magazine illustrations, and radio shows. 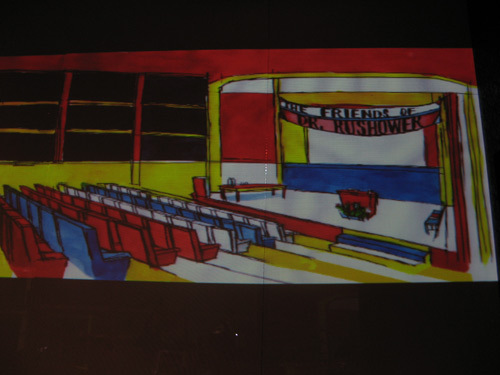 Katchor wrote the libretto and created the animated drawings for The Slug Bearers of Kayrol Island (or The Friends of Dr. Rushower), the show I was at The Vineyard Theatre to see tonight. (The same company developed the critically acclaimed Avenue Q and [title of show].) Check out the commercial for their latest show here. Katchor described it as an “absurdist romance… about the romance of poetry and humanitarianism.” For his darkly funny, slyly political musical, he collaborated with Mark Mulcahy, former frontman for indie rockers Miracle Legion and Adventures of Pete & Pete house band Polaris. 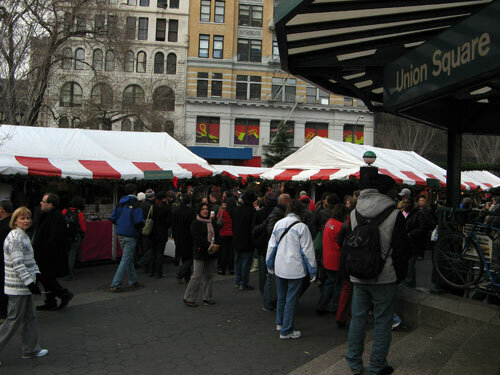 The Kitchen, New York’s non-profit experimental performance space, commissioned The Slug Bearers of Kayrol Island and secured the majority of the show’s funding; it was presented at the Massachusetts Museum of Contemporary Art in 2003 and at The Kitchen in 2004 before making its way to Union Square. The action is set in Manhattan and on a tropical factory-island in the fictional “Roomy Archipelago,” where workers toil to transport small lead weights (destined for placement in unseen appliances to give the impression of “heft and worth”) from factory to ship. After the laborers plight is exposed on the news, well-intentioned philanthropist Dr. Rushower (Peter Friedman) takes it up as his annual cause to organize an expedition from New York City to Kayrol Island; he sends his idealistic daughter GinGin (Jody Flader) and her suitor Immanuel Lubang (Bobby Steggert) to provide solace to the exploited workers by introducing them to the beauty of “consumer fiction” — poetry found in the text of obscure appliance instructional pamphlets. Complications ensue when the locals don’t — or can’t — appreciate the offering, and GinGin falls in love with local slug bearer Samson (Matt Pearson) — who, as it happens, is not all that unhappy with his lot — drawn to the liberation of a life where labor is divorced from purpose. Katchor’s colorful, shifting landscapes are projected onto large, folding screens on stage: a swanky penthouse, a poetry slam at a Macedonian coffee house, a city street, a biplane soaring over the ocean, a tropical paradise marred by smokestacks and cinderblock buildings… The overall effect is whimsical and delightful, and Mulcahy’s catchy pop score is sung through by the actors and played with terrific energy by an actual four-piece rock band. 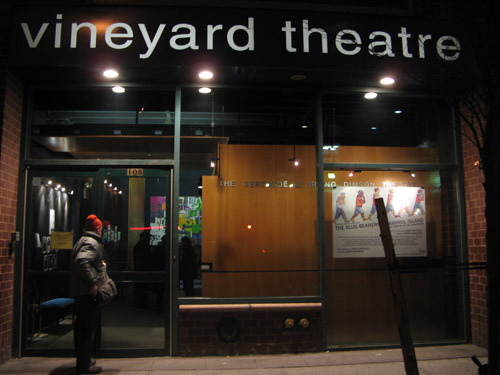 The Slug Bearers of Kayrol Island is playing at The Vineyard Theatre through March 2, 2008. 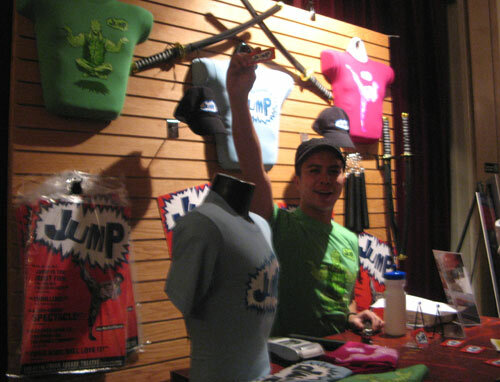 Jump was created by Korea’s Yegam Theatre Company, and spent several years in development before it premiered at the Woolim Cheongdam Theater of Seoul in 2003. 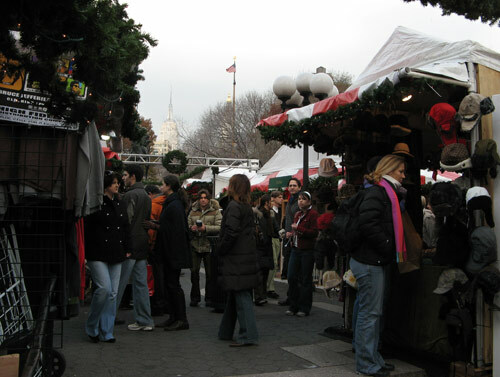 Since then, the show has had successful engagements throughout Asia and Europe, earning a Comedy Award at the Edinburgh Fringe Festival in 2006. The 90-minute spectacle began an open-ended run at the Union Square Theater on September 25, opening officially on October 7 before a packed house that included the Jolie-Pitt crew. 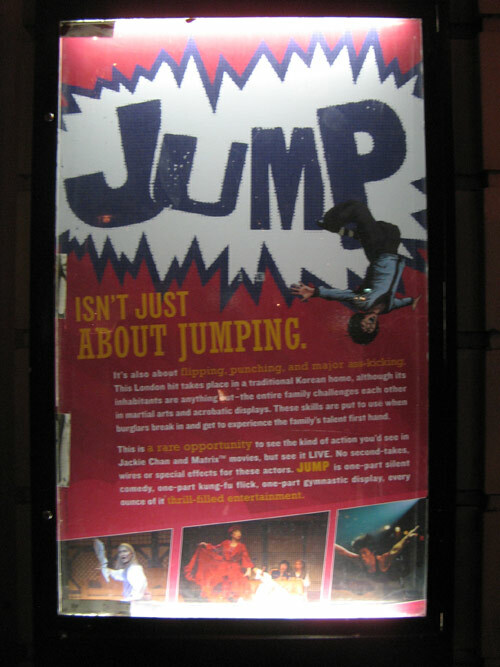 Another entry on the long off-Broadway list of “barely verbal foreign imports” (see: Stomp, Blue Man Group, Fuerzabruta), the show is part slapstick comedy, part martial arts demonstration, and part gymnastics display, with shades of The Matrix thrown in. The men and women of the cast rotate their roles regularly, and were culled from experts in kickboxing, gymnastics, modern dance, and theater. The story, such as it is, revolves around a family of five martial arts specialists (grandfather, father, mother, drunken uncle, daughter) and their skirmishes. During the first act, an unassuming, nerdy young man visits the household and promptly falls in love with the daughter. (We later discover that he is transformed into a wildly gyrating, mesh-shirted Lothario once his coke-bottle glasses are removed.) With seeming randomness, a series of segments are strung together in which the various cast members challenge each other to impressively athletic martial arts and acrobatic displays, under the supervision of the imperious grandfather. All these well-honed skills are put to good use when a pair of hapless burglars break into the family home in the second act. They fight, they woo, and occasionally members of the audience are brought up on stage to participate in the shenanigans… It makes no sense, really — “more a stage version of Kung Fu Hustle than actual theater” — but it was far more fun than I expected going in. Tonight’s burglars — Yun-Gab Hong and Seung-Youl Lee — at the post-show meet and greet. 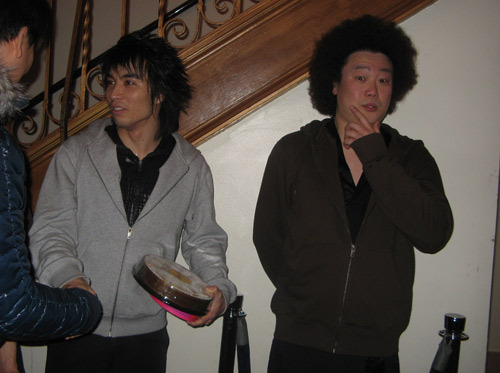 Love the ‘fro! Afterwards, we ended up at nearby Republic for what may have been the fastest dinner on record. Barely were the orders out of our mouths when the food hit the table, in seeming defiance of all physical law.